BANGI, 1 Dec. 2010 – A healthy society is not only a society with high per capita income but also a society that practices good ethics and professionalism in all fields, said Universiti Kebangsaan Malaysia (UKM) Vice Chancellor Prof Tan Sri Dato’ Dr Sharifah Hapsah Syed Hasan Shahabudin here today. Thus sound morals and ethical behavior must be institutionalised within our character over time and they must become a way of life. 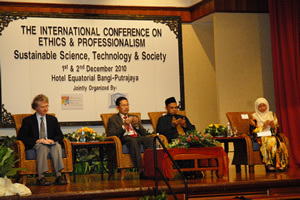 They cannot be established or created in a day or a semester or a year, she said in her address when officiating the first International Conference on Ethics and Professionalism that is jointly organised by the Centre for General Studies of UKM and the Regional Unit for Social & Human Sciences in Asia and the Pacific (RUSHSAP) of UNESCO. Her speech was read out by her deputy, Prof Dato’ Ir Dr Hassan Basri (Academic and International Affairs). Scandals involving big companies such as Enron, Arthur Anderson, Morgan Stanley, Worldcom and others had awakened the people towards the importance of ethics. The number one reason for these scandals are due to infectious greed of the corporate leaders who are usually professionals, she said. Thus issues related to ethics and professionalism needed to be brought to the forefront given those scandals had disturbed the business landscape around the world. The two-day conference on the theme “Sustainable Science, Technology and Society” is attended by over 200 participants, paper presenters and speakers from Bhutan, India, Iran, Japan, Nigeria, Pakistan, Taiwan, Switzerland and Malaysia. Sharifah Hapsah said these scandals and their massive negative impact resulted from unethical behavior and made people aware that unethical behavior not only failed to protect the stakeholders but also disturbed the equilibrium of the business landscape around the world. She said many university curriculums, including UKM, were now earnestly applying the teaching of ethics and for good reasons. “Young minds will take this information into the workforce and understand that ethics need to be applied there as well as in private lives,” she said, adding that UKM as a agent of change, felt that it was timely to bring ethical and professionalism issues to the forefront. 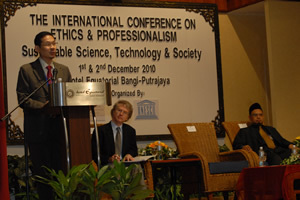 Based on the papers to be presented, she hoped that the conference would be successful in providing a comprehensive overview of current thinking, research and practices on ethics and professionalism in relation to sustainable science, technology and society. “I hope the collective minds of the scholars, practitioners and thinkers in this conference will produce concrete ideas, ways and means on how to impart and strengthen good values and ethical behavior for the benefit of individuals, community, organisation and our respective country,” she said. 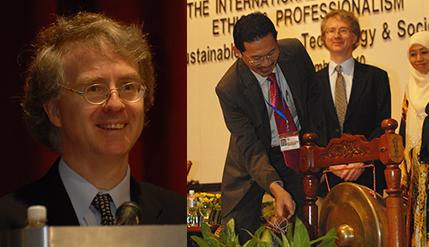 Earlier, Prof Dr Darryl Macer, the regional adviser of RUSHSAP, said in his welcoming remarks that the conference is a broad platform for them to ask about the future they wanted, and to discuss policy and practices related to ethics and professionalism in the context of real world applications of science and technology. They would also consider what constitutes ethics and professionalism in terms of sustainable science, technology and society. Also to be discussed is how to develop ethical standards and how to educate the new and older professionals, in response to new technology in areas like genetic testing.